Mercedes-Benz is renowned for its top-tier performance, sheer refinement, distinct styling, and utter luxury. As such, dealerships carrying this brand should reflect the nature of the Mercedes-Benz brand, and O’Regan’s Mercedes-Benz does just that for drivers in and around Dartmouth, Bridgewater, South Shore, Sackville, and Bedford. From the moment you set foot inside our showroom, you’ll notice the difference we bring to the dealership experience. For one, our extensive inventory brings you closer than ever to the car of your dreams. That’s because we carry the entire lineup of new Mercedes-Benz models in a variety of trims and colors, so you’re sure to find one that suits your unique driving needs and desires. We also offer many pre-owned vehicles, including several Mercedes-Benz that have been certified for their quality and like-new demeanor. Whichever avenue you go, O’Regan’s Mercedes-Benz makes our customer’s satisfaction our top priority, so you can rest assured that we’re never out to mislead you. In addition to our vast car selection, our finance and service departments are always at the ready to enhance your dealership experience. Apply for financing online to expedite the process, and always expect rates and monthly payments that fit within your budget. Schedule your automotive service if you want quality repairs and quick, efficient maintenance completed. Our trained and certified professionals have the knowledge and equipment to handle anything you bring our way, and the authentic Mercedes-Benz parts to get the job done. 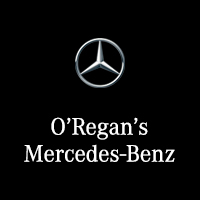 Choose O’Regan’s Mercedes-Benz to truly understand what the Mercedes-Benz brand represents. Visit our conveniently located dealership at 3585 Kempt Road in Halifax, NS, and please get in touch if you have any questions before you come by!